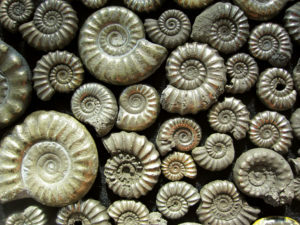 Fossils are hugely popular in these parts, with people flocking to the coast of Dorset and East Devon, eager to embark on a Great Jurassic Coast Fossil Tour. Many of them are drawn by the promise of seeing the remains of real prehistoric monsters. Others hope to find a small relic of their own; a fossil to slip into their pocket and take home. 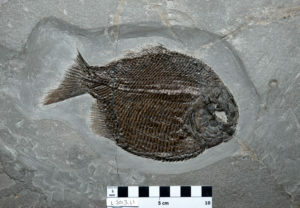 Whether its memories or mementos, an encounter with fossils rarely fails to make an impression. So what is the Great Jurassic Coast Fossil Tour? Well, it’s not all about hunting and collecting fossils. Our incredible World Heritage Site is 95 miles long and crammed with fossil stories that stretch across 185 million years of Earth History… hardly something you can get to grips with by visiting just one place. 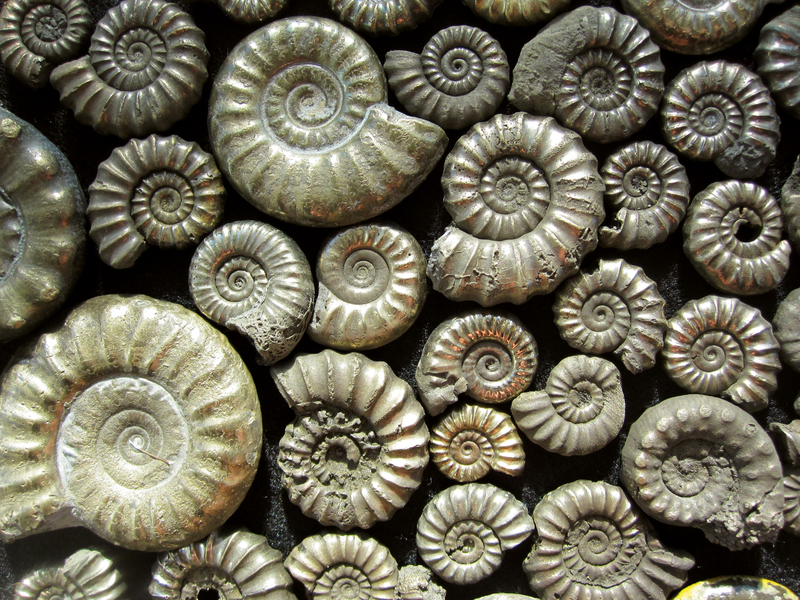 The Great Jurassic Coast Fossil Tour is a journey through time and across counties. It passes through deserts and tropical seas, dark forests, festering swamps and sparkling lagoons. It invites you to keep your eyes peeled, your head screwed on and your imagination revved up. All set? Then we’ll begin. RAMM, Exeter – The geology gallery at the Royal Albert Memorial Museum not only includes some of the most important fossils from the Triassic rocks of East Devon, the displays explore the entire geological story of the area. This will help you get a sense of where the Triassic Period fits in Earth History and how it connects with life today. 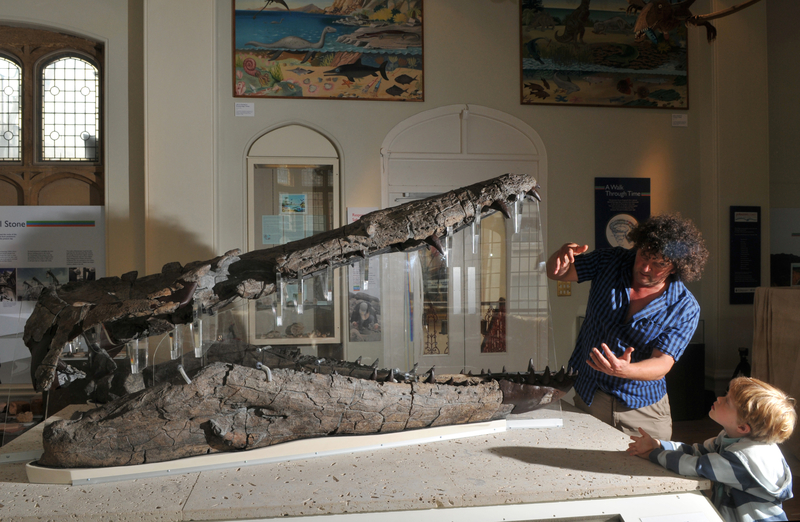 Sidmouth Museum – this volunteer-run local museum displays a fantastic selection of Triassic fossils, from the bones of giant amphibians to the rare fossil fragments of primitive reptiles that pre-date the dinosaurs. Iron Pyrite ammonites from Charmouth beach. Found in winter. The ammonite graveyard – a short walk along the beach west of Lyme Regis harbour will bring you to a set of limestone layers exposed on the shoreline. One of these is simply crowded with fossil ammonites. No one is really sure why there are so many there, but it is an extraordinary sight to behold. It is also protected by law, so please don’t try to collect these precious fossils. Lyme Regis Museum – recently renovated galleries at Lyme Regis Museum provide a spectacle for all fossil-lovers. Giant marine reptile skulls, ammonites, fish, insects and other rarities are crammed into cases and drawers and onto the walls. With lots to discover for all ages, it is the perfect place to begin your journey through the Jurassic. Charmouth – the beaches at Charmouth offer a rare opportunity to hunt and collect fossils for yourself. The best way to start is on a guided walk led by the experts from the Charmouth Heritage Coast Centre. Visit the centre to see what others have discovered along this world famous shoreline. Bridport Museum – Tear yourself away from Lyme Regis and Charmouth to continue your voyage through time. Bridport Museum showcases the next step into the Jurassic period with exquisite fossils of starfish. Look out for the Inferior Oolite. This incredible rock reveals a prehistoric change in sea level and also has deep connections to the history of the town. Dorset County Museum – From the World’s Biggest Bite to the tiny teeth of our early mammal ancestors, the Jurassic Coast Gallery at the Dorset County Museum in Dorchester has it all. Here you can see fossils from the length of the World Heritage site. The star attraction? a 2.5m long skull of a mighty pliosaur, one of the scariest predators that ever existed and one of the best examples anywhere in the world. The Etches Collection – This spectacular new museum in Kimmeridge showcases the collection of one man – Steve Etches. 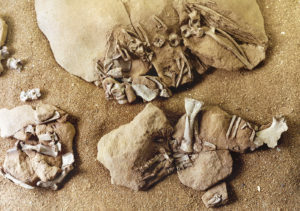 His treasure trove of fossils reveals a detailed record of the late-Jurassic ecosystems of Dorset. Steve has made several important discoveries, from new species of mighty marine reptiles to tiny ammonite eggs – a world first! Portland Museum – As the Jurassic ended, sea levels fell and a coastal forest developed. The fossilised remains of the trees and plants that flourished here 145 million years ago are regularly uncovered in active quarries. Portland museum has one of the most important collections of these fossilised plants in the country as well as specimens of giant ammonites and other fossils from the end of the Jurassic period. The Square and Compass – This small, privately owned collection on display in Worth Matravers is not an ‘official’ museum, but it does have the advantage of being in a pub! 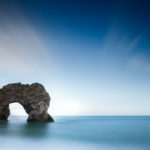 No trip along the Jurassic Coast is complete without a visit to the Square and compass, where Dorset cider, home-made pasties and impressive local fossils can all be enjoyed together! Can it get better? These dinosaur footprints are around 140 million years old. You can visit them in Purbeck. Keates Quarry – This magical site in Purbeck is hidden along the Priest’s Way national trail, just west of Acton. 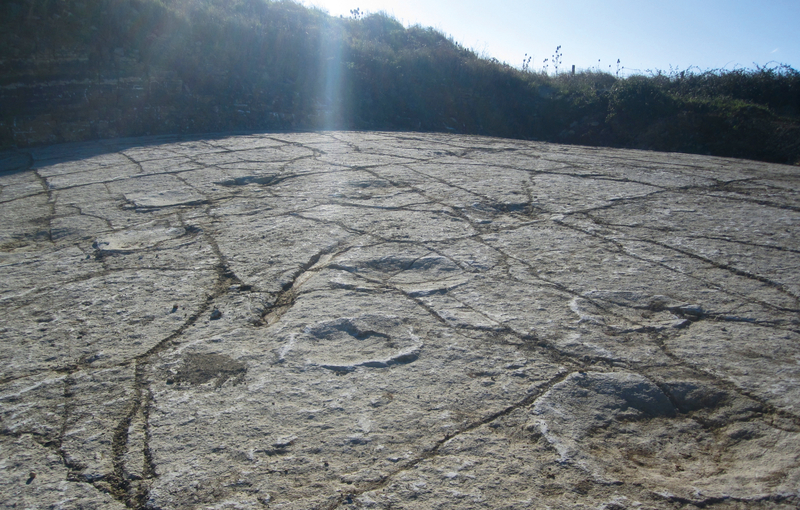 Nestled amongst grassy fields, in the exposed stone surface of an old quarry, are over a hundred dish-shaped impressions – dinosaur tracks. You can see fossil dinosaur tracks in museum galleries but this site goes one better. The tracks here are still in the bedrock. 140 million years ago dinosaurs walked in this very spot… and now so can you. For more information about Jurassic Coast Fossils why not check out the Jurassic Coast Fossil Finder database. You can also order a copy of our official guide to fossils from the World Heritage Site in our shop. 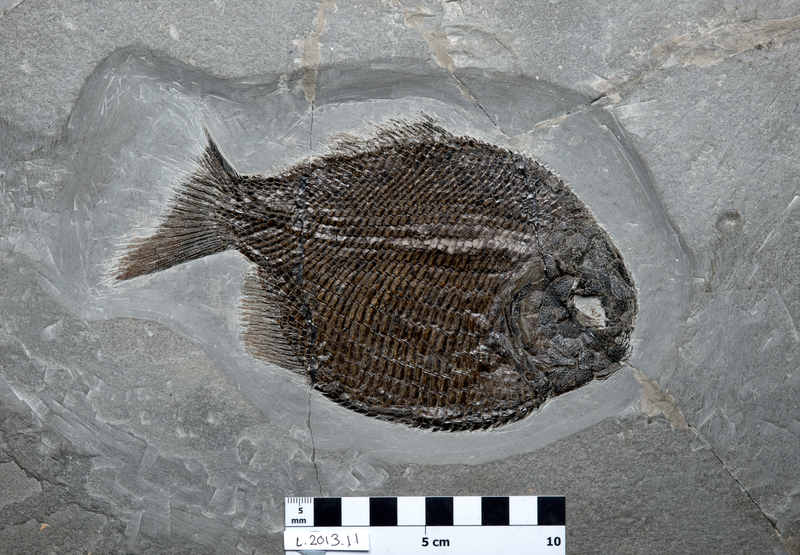 Visit the Natural History Museum in London or the National Museum of Wales in Cardiff to see the impressive specimens that made the journey from our coastline all the way into national collections. Thanks for this succinct and informative guide. I hope to do it all! That’s a good aim to have for 2018.